“There is a paradox at play when it comes to atrial fibrillation in the Latino population,” said Dr. Dawood Darbar. 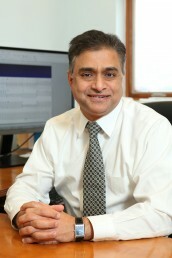 “While Latino individuals are less likely to develop atrial fibrillation than whites, despite having a higher burden of risk factors, they are more likely to suffer complications if the condition does develop,” said Darbar, professor medicine and pharmacology in the University of Illinois at Chicago College of Medicine. Understanding this paradox has been a challenge because most research on the genetic basis of atrial fibrillation, or AFib, has been performed in whites of European descent. With the development of a large, diverse registry of patients with AFib, the most prevalent heart rhythm disorder worldwide, Darbar and his colleagues at UIC have confirmed for the first time the association of a chromosomal genetic variant with increased risk of AFib in Latinos. The findings are reported in PLOS ONE. To identify common genetic variants, the researchers studied 713 patients who sought care at the University of Illinois Hospital in Chicago. The study group consisted of 103 Latino individuals who were prospectively enrolled in the UIC AFib Registry. Blood samples were analyzed for common genetic variants at a number of chromosomal locations and compared with genetic analysis results of 610 individuals without AFib. “Our goal was to determine if the top nine gene variants known to be associated with AFib in white patients also increase susceptibility in Latinos,” said Darbar, who is chief of cardiology. Latino patients were found to be at a 2.3-fold increased risk for developing AFib if they carried this common genetic variant, which is labeled rs10033464 SNP at chromosome 4q25. Darbar says this finding not only sheds light on the underlying mechanisms of AFib, but it also, and more importantly, helps advance prevention and treatment strategies for AFib in Latinos. “The presence of an AFib-associated genetic variant helps doctors personalize treatment for the individual patient,” Darbar said. This is key, he says, to preventing complications, the most serious and common of which is stroke, which in some cases can lead to lifelong disability or death. “It also alerts us to a possible familial link that can help identify when family members may also be at risk,” Darbar said. Co-authors on the paper are Brandon Chalazan, Denise Mol, Arvind Sridhar, Zain Alzahrani, Sara Darbar, Aylin Ornelas-Loredo, Adbullah Farooqui, Maria Argos, Martha Daviglus, Sreenivas Konda and Jalees Rehman from UIC. The research was supported by grants from the American Heart Association (17MCPRP33420153) and the National Institutes of Health (R01HL092217 and HL138737).